EVA Airways becomes the newest Dreamliner customer and will join the 787-10 launch customer team as one of the first airlines in the world to introduce the newest member of the 787 Dreamliner family. 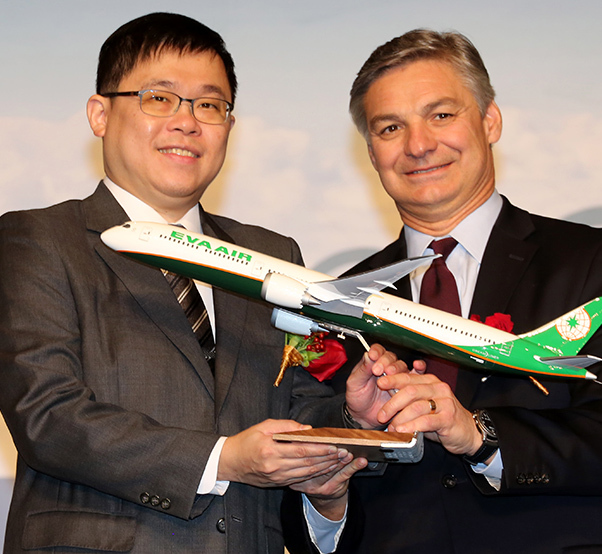 EVA Airways continues to modernize its long-haul fleet to replace aging aircraft and plans to grow its fleet to more than 100 units by 2020. These new 787-10 Dreamliners will allow the airline to expand into new markets. They will be deployed on medium-range and long-haul flights and will be operated in tandem with the 777-300ERs to form the backbone of EVA Airways’ fleet. EVA Airways currently operates more than 40 Boeing airplanes and with today’s order, the airline’s backlog will increase to 37 airplanes, which includes fourteen 777-300ERs, five 777 Freighters and eighteen 787-10s. EVA Airways’ 777-300ER fleet continues to grow and the carrier is the world’s eighth largest 777-300ER operator in the world and fourth largest in Asia. The 787-10 will be the third and longest member of the super-efficient 787 family. With its greater passenger and cargo capacity, robust range and passenger-pleasing features, the 787-10 will complement EVA’s Boeing widebody fleet while setting a new benchmark for fuel efficiency and operating economics. The 787-10 will be 25 percent better in fuel and emissions than the airplanes it replaces and more than 10 percent better than anything offered by the competition for the future.